Take the command of an interstellar fleet and lead it into war! In space, frigates and battleships compete tirelessly in epic battles. Your goal is to destroy your opponent's fleet! 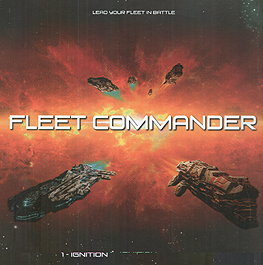 Fleet Commander is a space battle game with miniatures, intense strategy and clever tactic. With an original and simple system, the game is easy to handle and offers exceptional replayability and immediate gaming pleasure. 1 modular board with 4 two-sided tiles representing asteroid fields and gravitic fields. 14 spaceship miniatures with their marker bases. Each type of vessels has its own characteristics, strengths and weaknesses. You'll have to coordinate them on the battlefield to get an advantage over your opponent. 18 "Signal" tokens to hide your fleet from the scanner of the opponent. 6 special weapons offer the possibility to personalise your battleship. 18 special dice and 2 command bridges. In turn, a player chooses three dice among his command dice, throws them and either acts according to the outcomes or saves the result for the following rounds on the command bridge. There are dice to move, attacks and load energy into protection shields.